The last Wednesday of every May marks National Senior Health & Fitness Day in the United States. Tomorrow, May 29th is the annual holiday for 2013, at the end of Older Americans Month. Senior centers, nursing homes, gyms, and other community organizations across the nation will be participating in National Senior Health & Fitness Day. The day is intended to motivate seniors to stay healthy and fit. Over 100,000 people will be taking part in activities all over the country. In order to hold an official “Senior Day” event, the organization must register with the Mature Market Resource Center (MMRC). Another part of the annual National Senior Health & Fitness Day is the Mature Fitness Awards–USA. The awards is a fitness program created to encourage seniors to exercise more and keep their bodies active. the nation’s first fitness recognition program specifically designed for older adults. 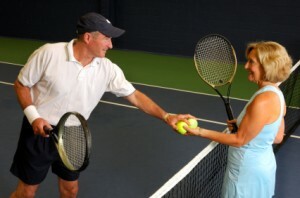 Some of the activities can be done individually but some require a partner or a group. The Mature Fitness Awards website includes a log where participants can log the activities they have finished and track their progress throughout the program. Exercise is a vital part of senior living because it prevents the body from becoming weak over time. There are many low impact exercises that seniors can do to keep themselves in shape. According to the CDC, working out can help prevent a variety of maladies including diabetes, heart disease, depression, some forms of cancer, and Alzheimer’s. Staying healthy in your senior keys is key to reducing your risk of needing long term care. Once you pass age 65, your risk for needing long term care jumps to 70%. By incorporating exercise into your daily routine, you can help prevent sickness, injury, and other disease that could lead you to require long term care services. Read the full MMRC press release here.